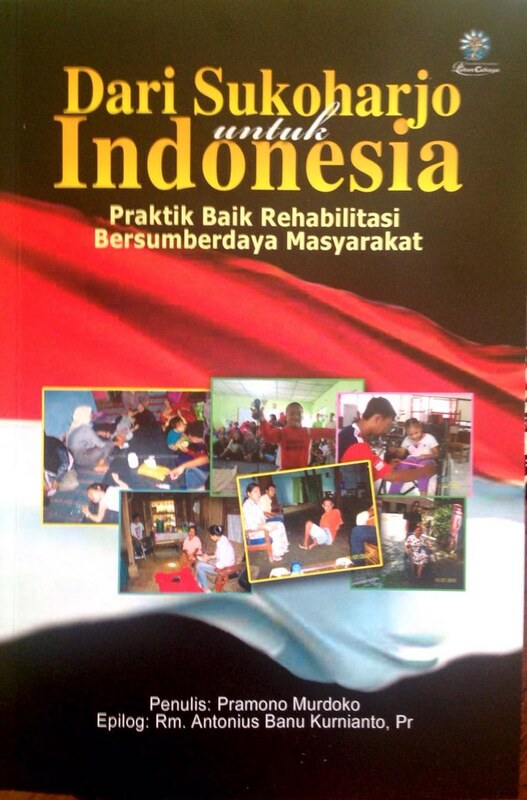 To address the needs of organization for the people with different abilities on the importance of the description of implementation or practice of RBM (Rehabilitasi Bersumberdaya Masyarakat/Community Based Rehabilitation) program in the field level, KARINAKAS published a book entitled: “Dari Sukoharjo untuk Indonesia, Praktik Baik Rehabilitasi Bersumberdaya Masyarakat” (From Sukoharjo For Indonesia, Good Practice of Community Based Rehabilitation) with the hope to inspire all parties who need to implement the RBM program in their respective areas. The book which was authored by Pramono Murdoko, the Manager Program of Care Program of KARINAKAS, was going to be reviewed on Thursday, 8 September 2016 at 9:00 a.m. in the office of KARINAKAS, Gedung Belarasa Jl, Panuluh 377 Pringwulung, Depok Sleman. The event was inviting the speaker, Pramono Murdoko (as the author), Setia Adi Purwanto (Director of Dria Manunggal), and Sunarman (Director of PPRBM Solo), and Nurul Sa’adah (Director of SAPDA) as the moderator. What is RBM? The definition for Rehabilitasi Bersumber Daya Masyarakat (RBM) by WHO was changing over time. RBM or CBR (Community Based Rehabilitation) which was initially emphasized the medical or education services, changes into a concern on the equal rights and lowering of poverty of people with special needs. Recently, RBM was interpreted by WHO (World Health Organization) as a strategy to improve the access to the rehabilitation service for people with different abilities to utilize the local resources in optimal way. KARINAKAS with all its limits and resources availability, without trying to deviate from the meaning of WHO, interpreting RBM as a way/method to restore the rights of people with different abilities by involving the stakeholders as much as possible and return the people with different abilities to their society life and environment. More specifically, KARINAKAS interpreted rehabilitation as not in the description context which referred to normal-abnormal nuances, where rehabilitation then be assumed for restoring from the abnormal to the normal. Rehabilitation concept which was defined by KARINAKAS was rehabilitation in the meaning of finding and improving the potentials based on the society’s demands. The existence of people with different abilities in the society since the beginning until today in the social and national life, the autonomy and welfare are still continues to be pursued by many parties. Government in this case, as the stakeholder who is responsible in realizing the welfare of its citizen conducts it through programs and policies. The same things are also conducted by non-governmental organization, such as religious organization, social organization, even organization with the people with different abilities as it members. The efforts made by government or non-governmental organization, also conducted by Karitas Indonesia Keuskupan Agung Semarang (KARINAKAS). KARINAKAS as the church social organization, since 2006 after the earthquake in Yogyakarta and Central Java, has been taken part in empowering the people with different abilities. In empowering the people with different abilities, KARINAKAS uses the strategy of Rehabilitasi Bersumberdaya Masyarakat (RBM/Community Based Rehabilitation). RBM alone is a strategy of people with different abilities empowerment by involving as many as possible the stakeholders, such as SHG (Self Help Group) and DPO (Diffable People Organization). Involving as many stakeholders due to the issues faced by the people with different abilities are so complex, so that the solution has to be holistic and comprehensive. RBM by KARINAKAS uses WHO’s matrix which include 5 components, they are health, education, livelihood, inclusion social, and empowerment. In the implementation, the RBM’s principles are based on CRPD (Convention on The Rights of Persons with Disabilities). KARINAKAS implemented RBM in 2009, and took place in Nguter and Kedungwinong Villages, Nguter Sub-district especially and Sukoharjo District generally. It seemed that the implementation brought positive impacts for people with different abilities, society and even government. Many activities to realize the autonomy of the people with different ability and inclusive society which are the main goal of RBM conducted by involving as many as possible the people with different abilities and society around the program areas. The support from the Administration of Sukoharjo District, relevant SKPD and Organization of People with Different Abilities helped give good colors for the continuity of RBM at that time, even until today. The good practices done through RBM, by KARINAKAS then documented in the form of book which was published.